Translucent copper next to SD Clear. No problem with the smash on hg#68. Mine arrived all the way over here in Australia this morning, thanks Smoke. 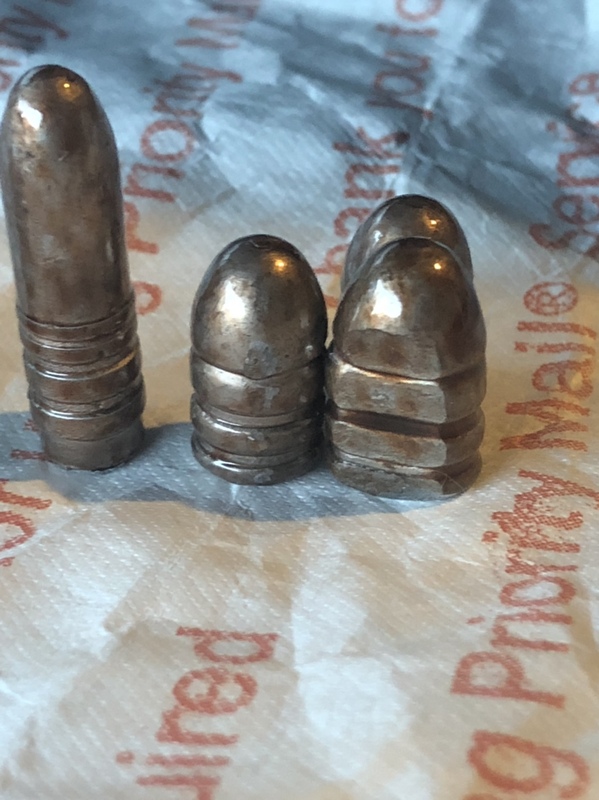 I did some .44 cal bullets tonight and they came out ok. The color is a bit splotchy in places but the overall coverage is as good as i get with the clear They do look slightly metallic from a distance so that's nice. I was using a new type of container that i have not used before so i can't be sure if that is the reason for the splotchy coverage. I'll have to eat a kilogram (2+ pounds) of yogurt to get the same container that has been working so well for me with the clear. What would happen if used the same container and BB's that i have been using with the clear? Are they compatible. I'll take some pics when i have better light tomorrow. I did some more with the Translucent Copper today. These are RCBS 340gn 45-70 Boolits. It's a hard color to photograph. The color is still a bit splotchy but it's better than my first try. I got my translucent copper today and tried it out. After a few small test batches, I got some that are a more consistent color. It definitely covers differently than the blue I've been using. I completely changed my application method and the amount of powder I use. I'm going to try some more tomorrow but I'm fairly happy with the results I'm starting to get now. For some reason, this color is really hard to get a good picture of. This is with no flash under the florescent lights in the garage. It looks better in person though. This color will not and is not intended to produce a solid opaque color. The beauty in this is the multi color hues it produces simulating the copper jacket multi hues. Hi, Sorry for the pics, as I am not real good with pics. This is just a small sampling. While doing this I decided to do a little experimenting as well. I also tried some of Smoke's Harvest Gold pc. Was hoping for a more true gold color but it isn't. It covers ok (a little thin) but would look better with 2 coats. It turns out like a buff color. It's not even close to the Harvest Gold you used to see on stoves & refrigerators in the past. Smoke's Translucent copper does good with 1 coat , but even better with 2 coats (darker copper look). Eastwood's Copper Penny is lighter than Smoke's & even with a 2nd coat of Copper Penny it still is light (slight improvement). It is my humble opinion that Smoke's is the best of the Two (2) types of Translucent Copper that I tried. West of St. Louis, Mo. TYVM for your assistance on getting this uploaded to the forum Smoke4320!!!! I'm still getting caught up after the storm, and still don't have solid internet, but I had coated these before we lost power, but hadn't had a chance to get a photo uploaded. On my monitor the color is accurately portrayed. They look to me like a copper wash more than plating or a jacket, but from a few feet away, they look more like copper than lead. This was also my experience with the copper powder... No so great. Glad folks are having better luck than I am. I got my powder in today and tried it on a small batch. 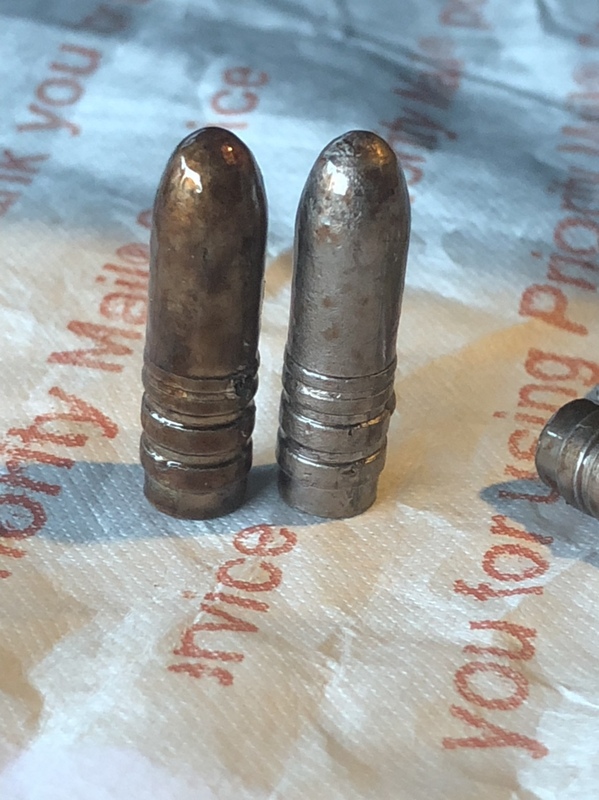 In one picture, it has two bullets side by side. One was coated once. The other coated twice. The smash test was on a single coating. I tried single coats at 400degrees for 17 minutes and 300 degrees for 25 minutes. There were a few other trials. None produced any discernible difference. Iron369. Something is wrong. No way should 1 coat look like your picture. I bought the bb’s from you. I may have not shaken long enough. it was definitely a #5 bowl. Even though the color is not as deep as the one with two coats, it is coated completely. 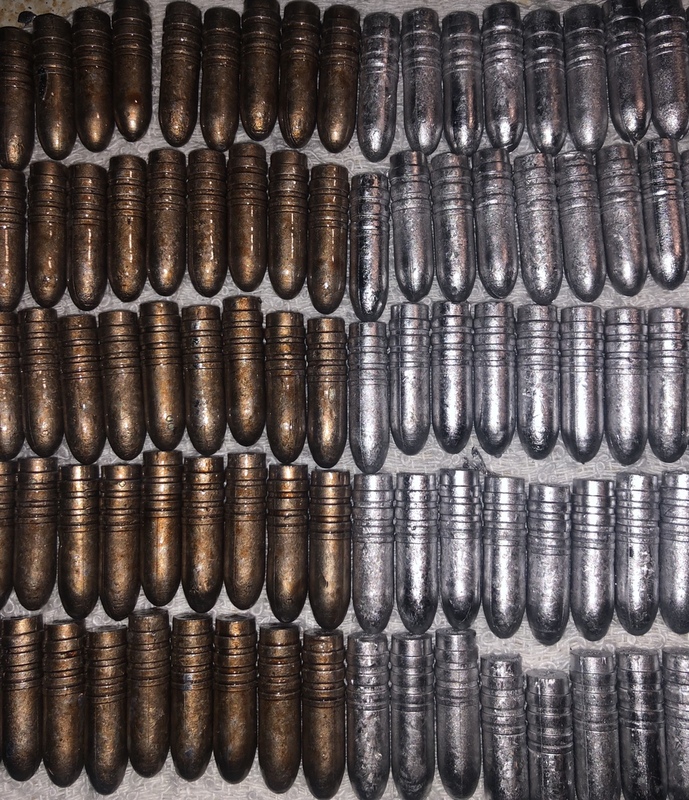 I’m really new to powder coating bullets, but I did industry powder coating for several years. The coating looked pretty heavy as a dry powder. Second batch. One coat. Picture shows coated and uncoated. Just got my Translucent Copper in the mail today! Ordered late last week! How come Amazon Prime can't do that? Thanks Smoke now I have to cast more boolits to try it on. Should the number in the triangle be a 5? I thought it was 3. I use a different container all together, but works well. I’ve just told others to look for a 3 not 5. So it’s a 5 in the triangle. I thought someone said it was a 3. I’m using something else that works well for me, but I have told others to look for a 3 in the triangle, not a 5. I hope they figured it out. Here is some loaded 357 I made up Lee 358-158-RF cast from a six cavity mold. I like it. Tried shaking the tub on top of a wool blanket to make more static. The humidity was high that had been raining all night. I finally coated some with this powder and they look great and passed the smash test! !